OVERLAND PARK, Kan. (June 15, 2016) – Leaders in sports equipment safety convened for the National Operating Committee on Standards for Athletic Equipment (NOCSAE) bi-annual standards meeting in Kansas City on June 10. Key topics included the advancement of the world’s first chest protector standard for commotio cordis, football helmet standards to address concussion risks and performance requirements for newly manufactured lacrosse balls. NOCSAE introduced the world’s first chest protector standard for commotio cordis at the January 2016 standards meeting. Commotio cordis, a heart rhythm disruption caused by a blow to the chest, is a leading cause of sudden cardiac death in young athletes. NOCSAE has funded more than $1.1 million in research to help identify the specific cause of commotio cordis and develop a chest protector standard designed to significantly reduce the likelihood of occurrence. The proposed standard applies specifically to baseball and lacrosse players. Although rare, catchers and goalies in these sports are typically the most vulnerable to commotio cordis. The proposed chest protector standard is currently open for public comment through January 2017. Earlier this spring NOCSAE representatives and technical advisors met with manufacturers to solicit feedback on testing methodologies. Preliminary input shared at the June meeting included recommendations to refine the criteria and equipment required for testing. NOCSAE will continue to collect data and meet with interested parties. At the meeting, the NOCSAE Standards Committee Consensus Body voted to move its proposed performance standard for newly manufactured lacrosse balls to final status. The technical advisory team studied a range of performance and construction issues related to lacrosse balls to help improve safety and limit the hardness of the balls to a range that is less likely to cause some injuries. The new standard establishes specifications for the weight, circumference, hardness and performance characteristics of lacrosse balls manufactured in the future. It will go into effect in June 2017. In January NOCSAE proposed a new football helmet performance standard that is currently open for public comment. The new proposed football helmet standard incorporates rotational accelerations in the pass/fail specifications and includes provisions for adjusted pneumatic ram impact velocities for helmets that manufacturers label as youth helmets. NOCSAE has received significant feedback from interested parties, and the technical advisory team will be working to address questions and incorporate input in the coming months. Also part of the revision to the new football helmet standard is additional testing specified in the pneumatic ram test standard. 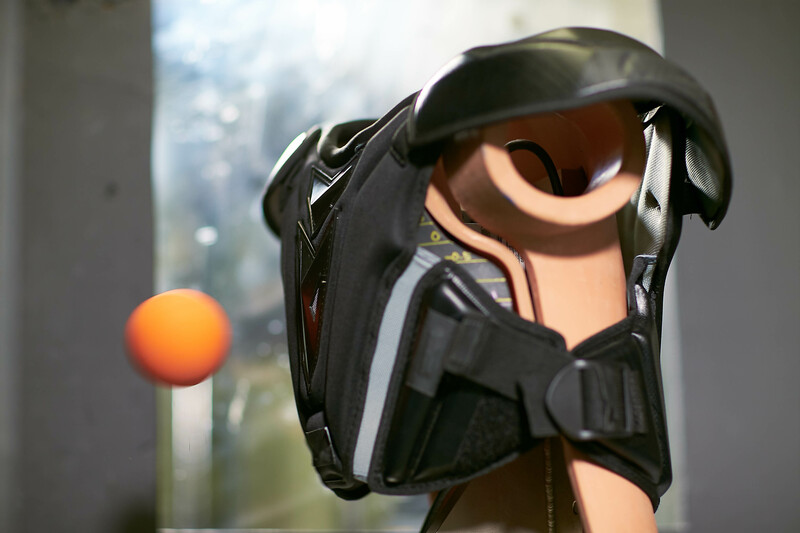 The pneumatic ram test standard includes new tests that create and measure rotational accelerations, a crucial first step in improving the ability of helmets to address the risk of concussion. NOCSAE continues to work with testing engineers, laboratories and manufacturers to address concerns regarding the reliability of this testing protocol. The pneumatic ram test standard was moved to final status in January 2016, but implementation will be aligned with the new football helmet performance standard. NOCSAE also provided an update on the development of the proposed performance standard for newly manufactured lacrosse helmets and facemasks and voted on several modifications and revisions to proposed and final standards.